Images by Loris von Siebenthal. Pierre le Clainche has made the transition to the bigger leads since he left the F18, where he achieved a Youth WC. He went to the X40s with Red Bull and suffered a serious accident in his arm. But after a great recovery he is back a stronger than ever, now racing the D35s Vulcain Trophy series with Team Django. Report by Pierre le Clainche: "Awesome! The 1st act of the Vulcain Trophy finished last Sunday after 13 amazing races sailed in different kinds of wind speed. 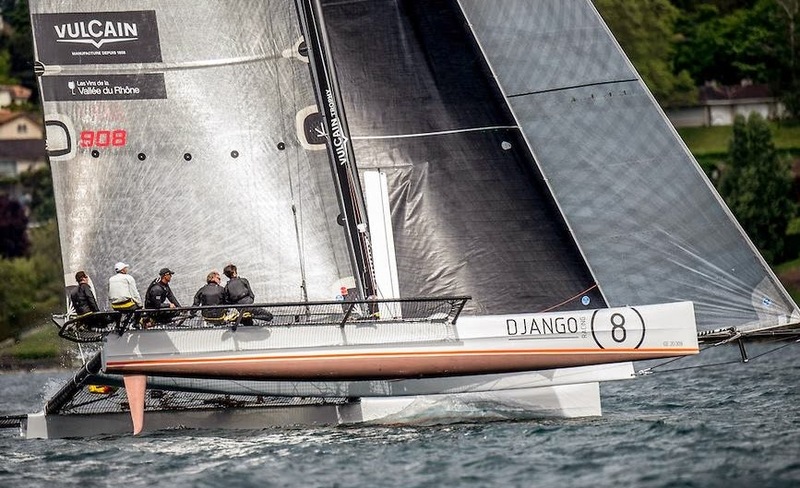 I'm taking part in the Racing Django team powered by Jan Eckert, we have lot of things to learn and although we finished 11th, we improved a lot and we keep to ourselves some very good teaching after our first victory on the last race. The Decision 35 circuit represents the most high level category multihull championship in Europe. Two very good Switzerland teams (Alinghi and Realteam) are taking part into the Extreme Sailing Series this season against the best sailors of the world like Ben Ainslie, Franck Cammas and Dean Barker. And these D35 teams did very well against them, proving prove the high level of Lake Leman competitions. Now he’s steering the D35 Racing Django and because of his lack of experience on multihull he wanted specialists around him to help himself. That’s the reason I’m now trimming the main sail close to him. Onboard we have great sailors like Yvan Ravussin (Jules Verne World record on Banque Populaire with Loick Peyron) who plays the role of the technical manager, Emmanuel Dyen was our tactician for this Grand Prix (both times selected in Olympic Games on 49er in Beijing and London), Nicolas Anklin (many seasons onboard D35) is doing the trimming and Hervé Bassignana (French with lot of experiences on different boats and D35 as well) is our bowman. The season was launched last week after one month and half of training. Boat is like a big great toy, able to fly and go fast with only 4 knots thanks to the 3DI Code 0 and the huge gennaker. Competing against Alinghi, Realteam and LadyCat powered by Spindrift is like a dream. The high level of the fleet gives us energy to surpass ourselves. Although we don’t have many chances to beat them on the regular championship, we could do something on the two long distance races as Genève-Rolle-Genève and the Bol d’or. The lake is so unpredictable that you know everything could happen that’s why we never give up!